$1.4B Michigan credit union's year-end member return includes a 75% loan interest rebate, 75% dividend boost and debit card rebates. 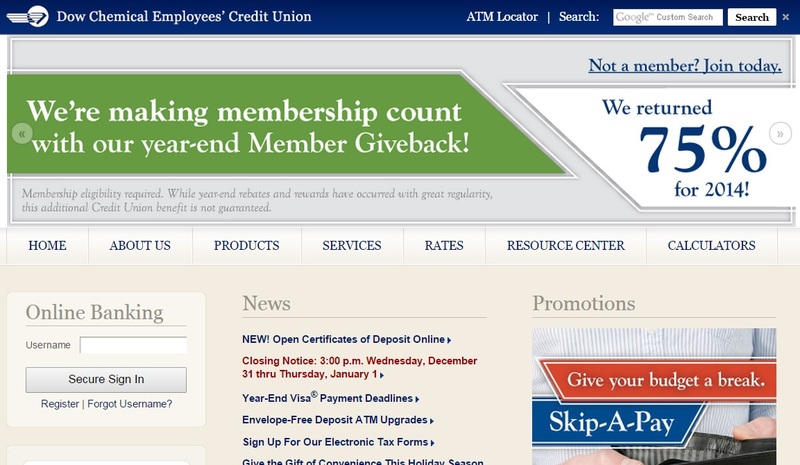 Dow Chemical Employees' Credit Union promotes the big membership rebate on its website. The $1.4 billion Dow Chemical Employees’ Credit Union of Midland, Mich., announced a record-breaking membership payout. On Jan. 1, members in good standing will receive a rebate of 75% of the total interest they paid on eligible loans during 2014, an additional 75% of dividends earned on shares and deposits during 2014 and check card rebates that include 0.125% of signature-based transactions and one cent for each PIN-based transaction during 2014.